Seems there is lots of bad info out there on the internet related to how much or what way, lets straighten that out. In Saab terms.. In the end this is not a VW! From my Viggen you can see that it looks as if there is not one there! It is tucked away down by the AC. In the charge pipe down to the intercooler. This gives a short route back to the intake pipe post MAF.. Being a t7 car we must keep all the measured air inside. Now some say that you have to run a super hard spring to get the most power out of it. NOT THE CASE. The function of the spring is to overcome the stiction of the piston and its seals thats all. There is boost from the manifold “vac” line on the top of the piston closing it. If the spring is too hard then you can see it will take more engine vac to open it, not a nice thing to the compressor. We want the fastest response open. This can be accomplished by running the softest spring in the valve. That way it is fully open sooner. VIggen 440tq and 450hp on the wheels Green spring! Drag car 2x -001 Dump Valves.Yellow spring. (They are not the dual piston -004 street dump valves so we want them to stay closed more based on idle Vacuum. . It makes around 540hp to the wheels. The second part of this is how T7 manages the valves. We will deal with this in another post. It is a simple change. 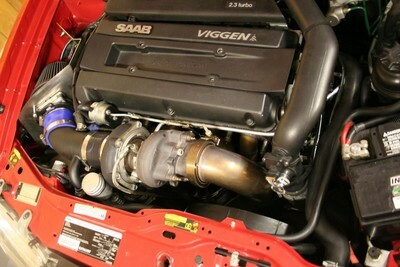 This entry was posted on Tuesday, October 27th, 2009 at 10.29 am and is filed under (Nicks) Viggen, HowTo, Powertrain. You can follow any responses to this entry through the RSS 2.0 feed. You can leave a response, or trackback from your own site.